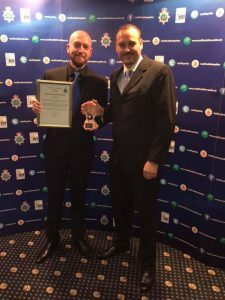 Every year, at the Staffordshire Police Force Awards, Staffordshire Police Unison present an award to a nominated recipient. The criteria for the award is a Police Staff UNISON Member whose actions have benefited the community or their work colleagues? They may have undertaken charitable work on behalf of a worthwhile cause? They may have helped a work colleague in their time of need? If you believe you know someone that falls into this criteria please complete a nomination form. This can be done at any time of the year and will be put forward with the nominations at the end of the each year. ANY EMPLOYEE OF STAFFORDSHIRE POLICE can nominate an individual. 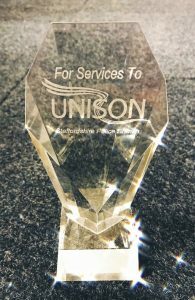 If you do not know if the nominated person is a UNISON member please still forward them as the Branch Office will make a membership check on all nominations. Awards are made in retrospect. This year’s Staffordshire Police Unison Award has been presented to PCSO Simon Holmes by the Branch Secretary Rob Birch. Very well deserved. PCSO Simon Holmes has been working as the local PCSO for Shelton neighbourhood for a number of years and within this time, he has built strong community relationships which have allowed him to build an intelligence picture that has been invaluable to the policing teams working around him. Simon, through his day-to-day performance, uses his local knowledge to identify offenders and effectively target problems. Simon has a clear drive to safeguard those most vulnerable and work with partners to achieve the best outcomes. Simon often uses his initiative and in-depth knowledge of his local area to do this and has been congratulated by councillors, colleagues and partners alike for his commitment to problem solving and dealing with sensitive issues. Through his work, Simon has shown the true value PCSOs have to the policing family and the community in which he works. He has taken a proactive approach to reducing fear of crime and disorder and is a true asset to Staffordshire Police.